Those were probably simpler times, but I thought of that conversation quite a bit over the next few years, often in the context of knowing that I often had my priorities in the wrong order. For quite a bit of my 30’s and 40’s, priority number 3 ended up at number one, and I’m pretty sure that occasionally (going out and running long distances, for example, between ridiculous days at work) my family might have a reasonable case for saying that the 123 priority had been completely reversed. But, no matter what had happened during the course of any day, no matter how demanding the kids were, how long I’d spent at work, or how long the tasks associated with looking after the family took, Mrs E always insisted that we should spend an hour at the end of the day, just not doing anything except sitting on the sofa together, and usually watching TV. I used to feel guilty about this time, insofar as I might have been reading an improving book, or getting past three chords on the guitar, or organising some sort of cultural revolution, but sometimes you have to, well, just ‘be’, if you know what I mean. And as far as guilty pleasures go, an hour on the sofa holding hands with the missus is pretty low harm to anyone else. More recently, we’ve been gripped (if that’s the right word) by a new phenomenon, and, really the point of this blog, is to understand ‘why’, in the context of a whole lot of apparent reasons that appear to be ‘not’. 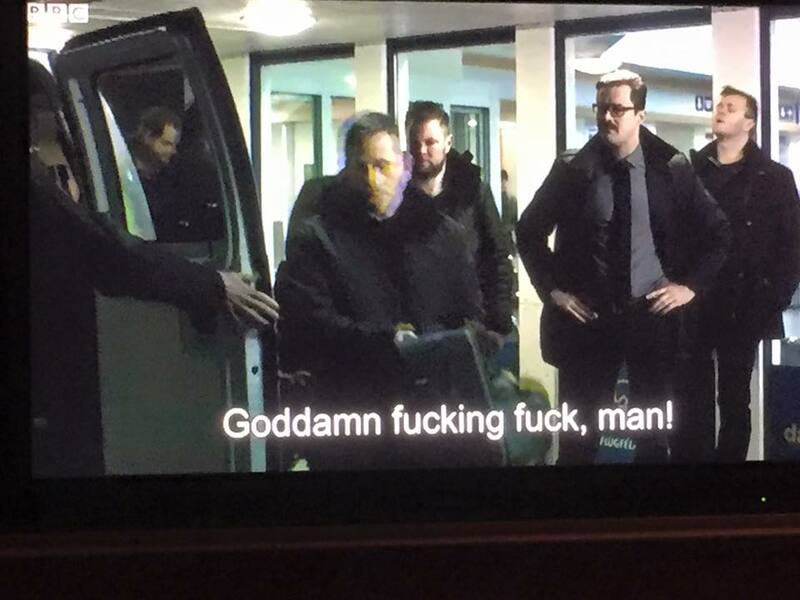 Anyway, of late, we’ve seen all manner of Nordic Noir thrills hit us on the sofa of an evening. We’ve had The Killing, in which Sarah Lund manages to make a fair isle jumper look vaguely fashionable. 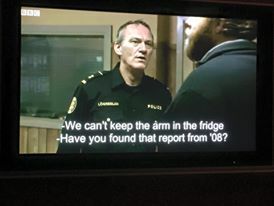 We’ve spent many hours in the virtual company of Saga Norén, the autistic/Asbergers detective in The Bridge, a role so out of touch with any empathy that it reminds me of, well, a number of police officers I’ve met myself over the years. We’ve wondered in awe at the elite team of detectives in Arne Dahl, each one less believable than the next. 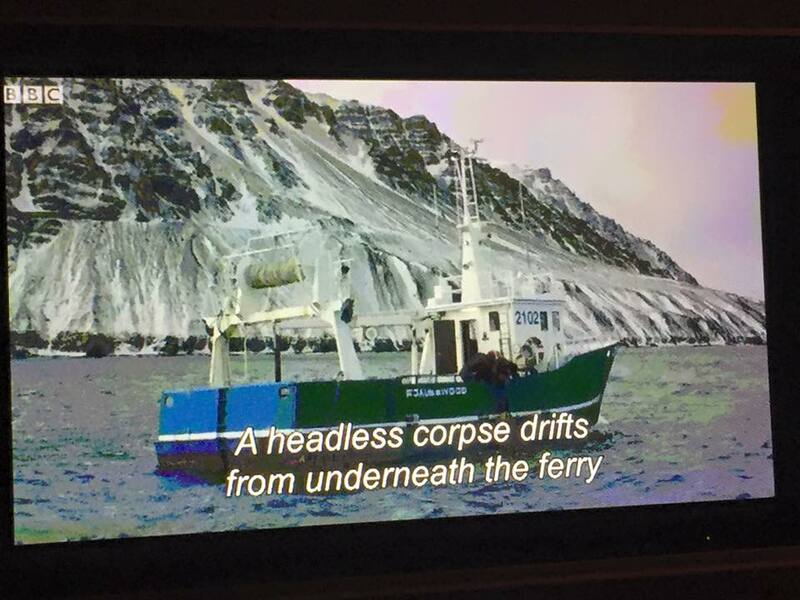 And we’ve shivered together on the sofa watching Trapped, an Icelandic romp where the weather is so appallingly bad that it might well have been filmed in black and white. As I write, we are just coming to the end of ‘Follow The Money’, in which a crooked Danish entrepreneur defends his clean energy company with an intriguing web of bribes, blackmail and subterfuge, whilst also starting to watch ‘Blue Eyes’, where healthy looking Swedes do battle in the run up to an election, at which the extreme but bafflingly incompetent right wingers might well be a front for some Neo-Nazi murderers. This has been particularly challenging on the ‘getting the plot mixed up’ front, partly for reasons that I’ll come onto in a moment. I absolutely love this list. I’m not sure which of the rules I love most, and the brilliant thing about the whole list is that it gives such a great insight to some of the rubbish that was being pulped out in the name of crime fiction around that time. But, given the world of our current viewing, I’ve felt obliged to add a few rules of my own to reflect the current trends, to determine what makes an acceptable Nordic Noir drama. 11. 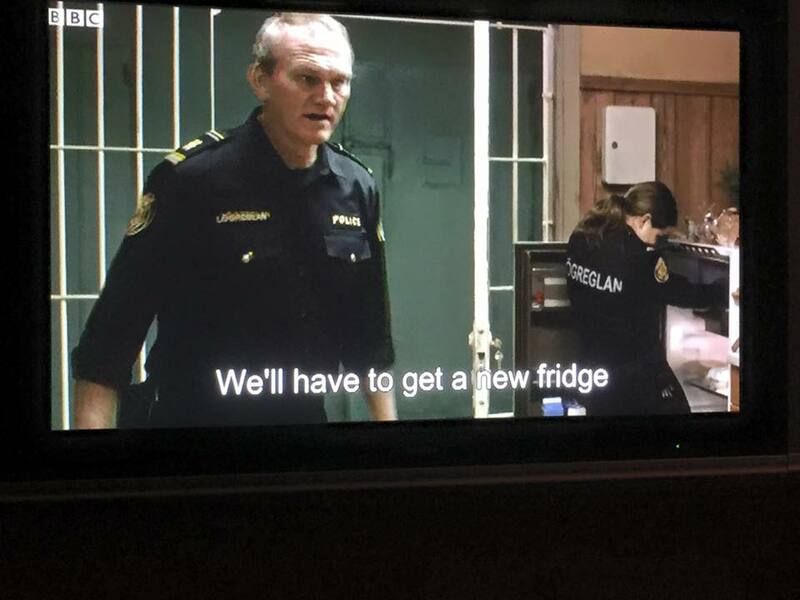 The viewer must be able to manage with subtitles. 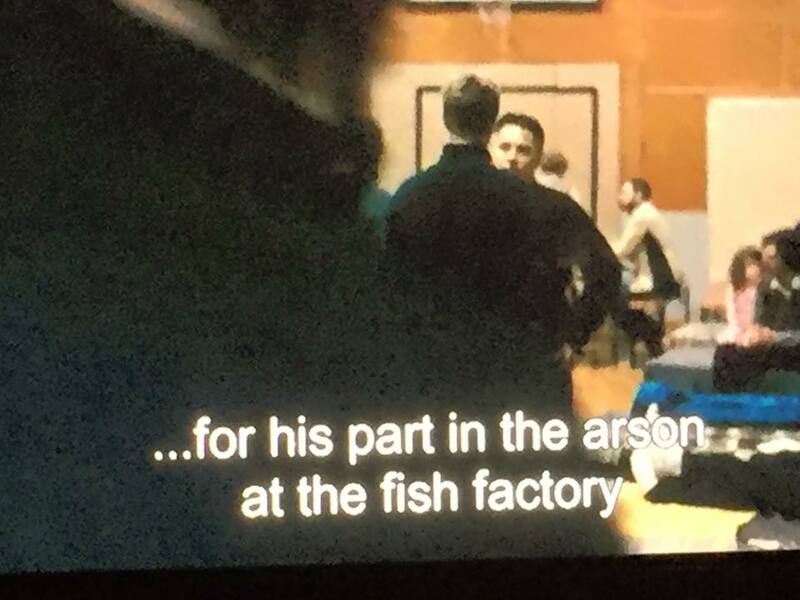 Note that Trapped has kindly provided us with subtitles actually on the police uniforms as well (see pics 3 & 4). 12. The majority of main characters must have names that are impossible for non-Scandinavians to pronounce. 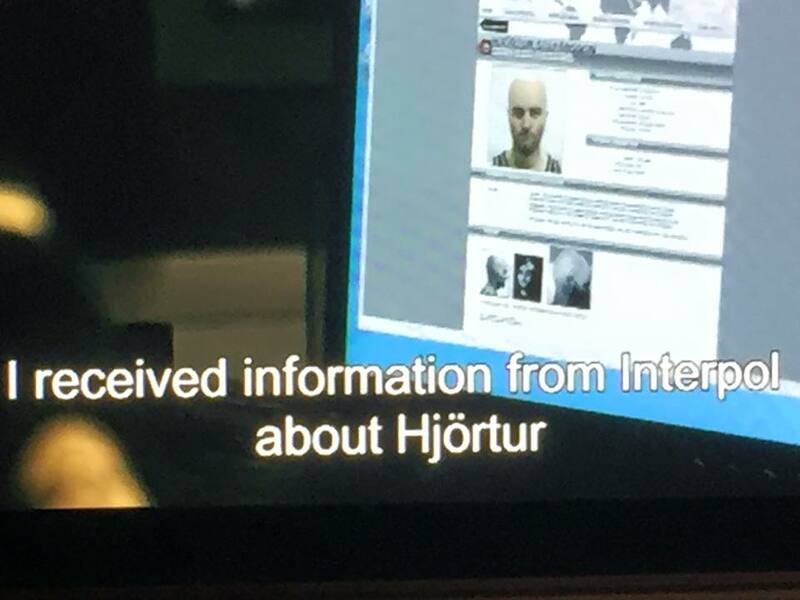 In Trapped, for example, we have Andri, Hinrikur, Ásgeir, Eiríkur, Hjörtur, Guðni, Sigurður, all being looked at by the mysterious Trausti Einarssson (he’s the one looking a bit camp in the last screenshot, and clearly not saying what the subtitler suggests he’s saying). Not being able to pronounce the names makes viewing much more challenging. I’m embarrassed that I don’t know how to pronounce Eiríkur, for example, so, I’ll say something to Mrs E like ‘I reckon the miserable bloke in the hat is a bit dodgy’, which doesn’t really narrow the cast down. ‘Shhhh’, she’ll helpfully respond, trying to keep up with the subtitles. To give you further insight on this, we were both really pleased when one of the main characters in ‘Follow The Money’ was introduced as ‘Nicky’, and whenever we talked about it afterwards, we kind of homed in on him because he was the only one we could confidently discuss. 13. The plot must be almost impossible to follow. In addition to the above complications, and the natural tendency of all the cast to look really shifty at all times, the plot needs to weave a complex path between mysterious pasts and political consequences. Ideally there should be a motive, and this is normally driven by greed and retribution (note, the more traditional plots of crime in the cause of love are a bit thin on the ground, but I guess that’s also why it’s called Nordic Noir). Anyway, it needs to be quite tangled, and not especially helped by the facts that a) each episode is a week apart on TV, b) you’re watching multiple series at once and c) the ‘catch up’ sequence at the start of the show is designed to show randomly chosen flashbacks, often in the wrong sequence, to completely throw you off course. 14. Minimise colour at all times. Again, it’s called Noir for a reason, but you have to watch a few of these to realise that there is, apparently no colour whatsoever to be seen outside in Scandinavia. There are exceptions, and the muted Ikea offices and bedrooms do have to odd splash of green and red, but for the most part it is as bleak as bleak can be. I reckon we sat through the entire series of ‘Trapped’ with not one scene shot in daylight, and with the only variation in weather being that it snowed a bit harder. Every now and again, one of the more outlandish characters appears in a non-black puffa jacket, which makes them stand out like the girl in the red coat in ‘Schindler’s List’, but I bet they get a few dark looks off set, for trying too hard. The exception to rule 14 is where copious amounts of blood are concerned. 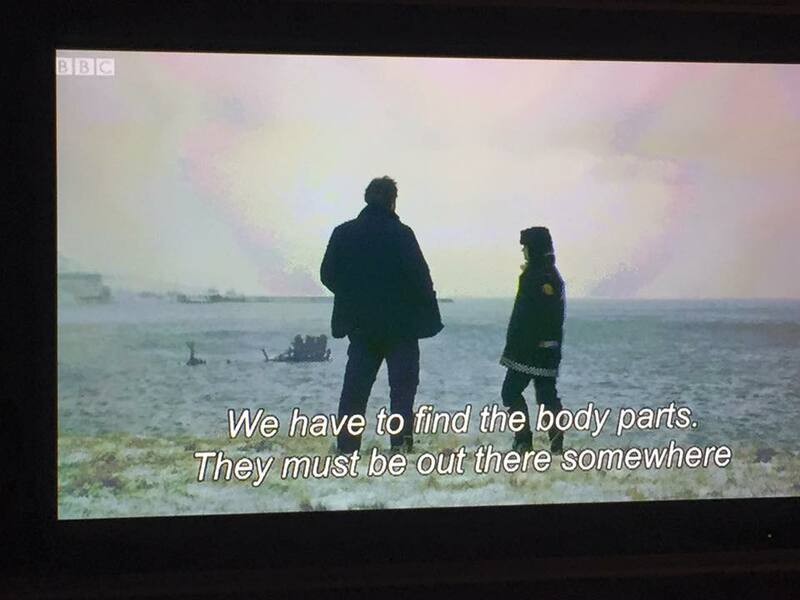 Nothing sets off a macabre dead body with a mass of stab wounds better than a backdrop of snow. Plus you get the added subliminal messages about the virginal white purity of the snow contrasting with the inhumanity and viciousness of, say Sigmunmondmusson’s tortured soul. The directors of Nordic Noir do seem to be trying to out-do each other with just how horrible a scene they can put in front of the viewer beyond the snow scene – we’ve seen hangings, replicas of bizarre artistic scenes and grisly basement tortures as well. If you took copies of these scenes, put them on your phone and showed them to your mates in the pub, they’d think you were a menace to society and probably report you to the police. 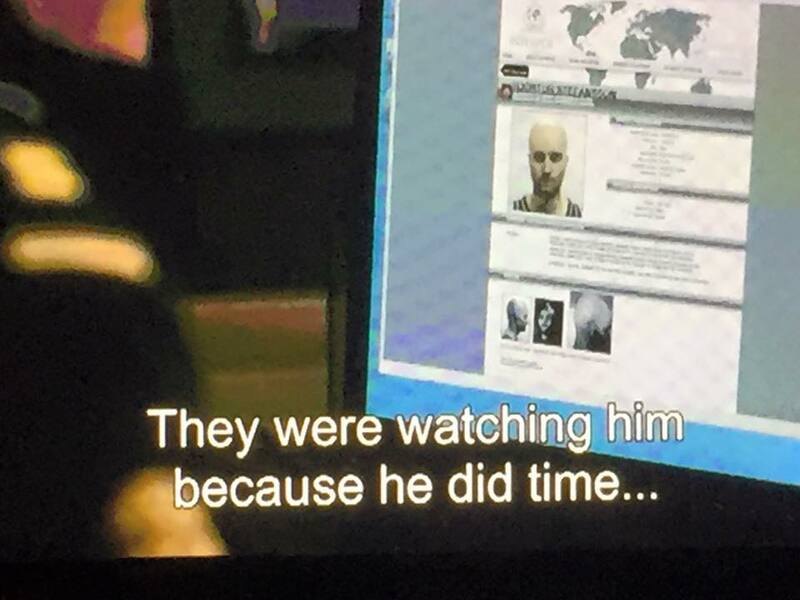 Oddly, watching them in the name of dark entertainment is ok, though. Which kind of brings us back to the point of this blog. It’s really strange, how our tastes in relaxation have changed over the years, and they seem to have landed in a world which is pretty much the opposite of relaxing. But we’ll continue our hour of ‘being’ of an evening, holding hands on the sofa, watching a bleak and violent story we don’t fully understand unfold, explained by frozen actors with dark expressions, speaking in a language we have no hope of learning, and trying to follow the whole thing on sub-titles that have been put in place by a reluctant writer with a warped sense of humour. All of which, bizarrely, seems to work. Not done the dramatic Norse deconstruction of Yggdrasil but I like the title of the blog, not bad for a Dylanophobe, can this really be the end?